The Back to the FutureÂ series made Michael J. Fox a household name, and have stood the test of time very well indeed.Â The storylines are still fantastic (if a little confusing in Part II) and the special effects hold up well.Â I also liked the way that the movie posters start with just Marty McFly stepping out of the DeLorean, but he is then joined by Doc Emmet Brown for Part II and the Doc’s love interest Clara Clayton being added for Part III.Â Anyway, this week we want to know which of the films you liked best. Which was the best Back to the Future film? One of the problems with boardgames is dice. They are one of the most important parts of any boardgame, as without them the game can’t really be played at all. At least if a counter is missing you could use a penny to replace it, but lose a die and it requires a trip to another boardgame to pinch one. The answer to boardgame enthusiasts everywhere was the invention of the Pop-O-Matic device. The Pop-O-Matic device was a plastic dome with the required number of dice inside to play the game it came with. Being much larger than the average set of dice it was much harder to lose, and in fact was often moulded into the playing board itself. Under the dome was a small piece of slightly bent metal, on which the dice rested. Pressing the dome caused the metal sheet to flip the dice into the air, thus rolling them. Another advantage of this was that it also stopped people from cheating as you had no control over how the dice were thrown. 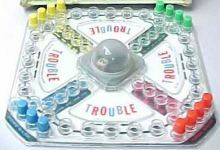 The pictured game is one called Trouble, which was pretty much an identical copy of the old classic Ludo just with the Pop-O-Matic device stuck into the middle of the board. It looks uncannily like a game called Frustration that I used to own, so I wonder if Trouble may have been the name it went by in the US. I believe this game dates back to the 1960’s or 1970’s or possibly even earlier. Certainly I remember the box lid featured some people playing the game with dress sense that could only have come from sometime around then. These simple toys were all the rage for a time during the 1980’s. They were the sort of thing normally sold by blokes in the street or at Sunday markets, and sold all the more due to them being at pocket money prices, and incredibly easy to demonstrate. Best of all was that when you did buy one, unlike something like jumping beans, they did actually work, at least until the stickiness finally wore off that is, which was usually after they had fallen on the floor a few times and picked up pieces of hair and dust. 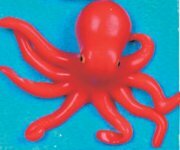 The toy consisted of a little octopus (other forms such as little men and spiders were also available) that was made out of a very stretchy rubber. The rubber was covered in a tacky substance which made them feel very strange against your fingers. The idea was to throw them at something vertical and shiny (Mum’s freshly cleaned windows were ideal) where they would first stick for a time before gravity took effect and the top legs would gradually peel away. Once the weight of the octopus body could no longer be supported the whole thing would flip over, and the legs that had just lost cohesion would stick back to the glass. The new top set of legs would then start to come away, and in this manner the thing flipped its way down the entire surface. If the rubber got too covered in dirt it would no longer stick properly, and would either bounce straight off when you threw it, or else briefly stick then drop straight off to get even dirtier. Washing it in warm soapy water could bring it back to life for a while, but eventually even this did no good and the toy was reduced to something you could squidge and stretch, and perhaps ping at your little sister like a rubber band. Now these bring back memories, and I’m pleased to say that they are still readily available today. The Jacob’s Happy Face is a biscuit whose closest comparison is probably the Jammie Dodger, but in my mind they are far superior. The Happy Face biscuit consists of two shortcake biscuits sandwiched together with raspberry jam and a dollop of vanilla flavoured creamy stuff. 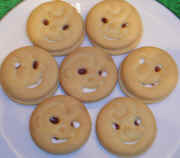 The biscuits have comical faces stamped into their surface, with the eyes and mouths being holes through which the jam and cream innards can be seen. The faces differ from biscuit to biscuit, so you can’t help examining each biscuit before you chomp into it. Whilst the Jammie Dodger is still a favourite, I feel the Happy Face wins overall due to it being a far more jolly teatime treat. One thing that Happy Faces and Jammie Dodgers share in common is that the jam has a tendency to go a little hard and chewy. I don’t know what the cause of this is, but when it happens it makes biting into the biscuit quite difficult. You end up having to bite into the biscuit then wiggle it up and down to get the jam to snap. The cream in the Happy Face does help prevent this problem to a certain extent, but it doesn’t completely eliminate it. These are another example of a toy that dates back many decades, but which were still popular in the 1980’s, and probably are still popular today, if you can find where to buy one that is. By Paper Dress-up Dolls what I am referring to usually came in the form of a book. The front or back page would feature a picture of a person, female or male, though usually the former, dressed only in their underwear. You cut this out (using scissors, making sure you got a grown up to help of course), along with a strip of card that had two slots cut in it. 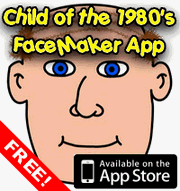 By slotting the strip of card onto the picture of the person you could make the figure stand up. Doesn’t sound that much fun so far does it? Where the fun came in was in the pages of the rest of the book. This comprised various articles of clothing and accessories for the figure, each with little tabs coming off at various places. 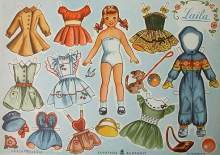 Cutting these out with your little pair of rounded end paper scissors was a bit of a fiddly exercise, especially around the tabs, but worth it in the end.Â By folding the tabs around the figure the clothes could be made to stay on, and so you could have hours of fun mixing and matching outfits to your hearts content. The NescafÃ© Gold Blend couple kept the people of the UK on the edge of their seats for the better part of the 1980’s with their “will they won’t they” approach to their relationship. Looking back it has to be said that the TV adverts were pretty cheesey, but it got to a point when people started tuning in to the adverts between shows because it was made known that a new installment in the series was about to air. Gold Blend itself was NescafÃ©’s attempt at creating a better tasting instant coffee, and the ads probably played a large part in changing the nations tastes away from the good old cup of tea and over to coffee. 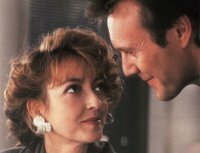 The couple were played by Anthony Stewart Head and Sharon Maughan. Anthony Head (he’s dropped the Stewart these days) is today best known for his role as Giles in Buffy The Vampire Slayer, and for playing the long suffering Prime Minister in the Little Britain Sebastian sketches, whilst Sharon Maughan can be seen in BBC hospital drama Holby City. Which toy was your favourite on Play School? Play School kept more than one generation of kids amused, and one of the ways in which they did this was to teach childrens the ways of the world with the help of the Play School Toys. Who can forget lovable rotund Humpty, possible furry siblings Big Ted and Little Ted (were they brothers? We may never know! ), Jemima with her long stripy legs, and Hamble, the, er, rather disturbing looking doll. Who was your favourite Play School toy? Indiana Jones is obviously making big news at the moment with the imminent release of the long awaited fourth movie in the series, Indiana Jones and the Kingdom of the Crystal Skull (what a mouthful that is). 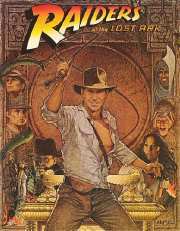 Whether the new film turns out to be great or not, we can at least console ourselves in the fact that the first film in the series, Raiders of the Lost Ark, is an exciting slice of adventurous fun that is the reason why we’ve had so many “big boulders rolling at the hero” sequences in films and TV shows over the years. The film opens with our hero Indiana Jones, an archaeologist and sometimes treasure hunter, deep in a jungle looking for an ancient artifact. After entering the cave containing the artifact and avoiding the various traps set up to protect it, Indy finds his treasure but sets off one final trap, the afore mentioned giant boulder. Escaping the cave Indy is forced to hand over the gold idol to rival archaeologist Rene Belloq who is waiting for him outside the cave with a group of local natives. Back at the university where Indy is a professor he is visited by two army agents who enroll him into the search for his old mentor Abner Ravenwood who is an expert on ancient Egyptian history. The Nazis are also trying to track down this man in an attempt to track down the Ark of the Covenant, which they believe has huge magical power. Indy is sent to track his mentor down before the Nazis can.